Birds in Everglades National Park mostly showed no fear of humans and sometimes allowed people to approach quite closely to them. The spoonbills being an exception to that. Take this cormorant for instance. 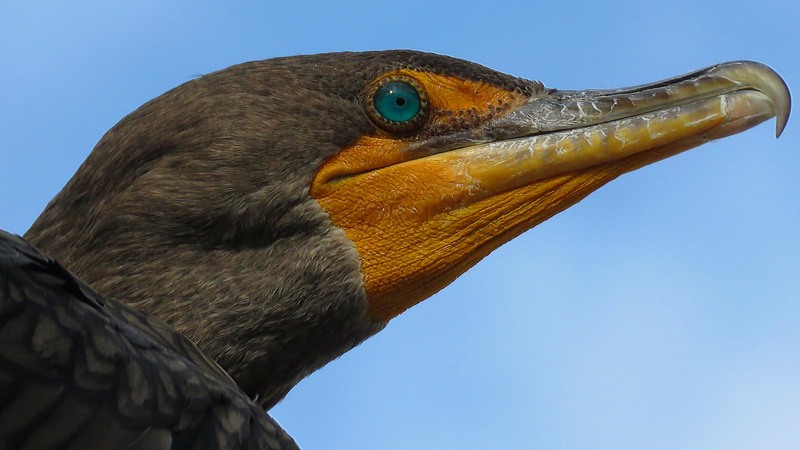 It was perched on the corner of a shelter, above the wooden boardwalk that comprised Anhinga Trail, near the Royal Palm visitor center. It would just sit there while visitors passed beneath it. This Double-crested cormorant is a cousin of the anhinga for which the trail was named. A distinguishing feature is its hooked bill, as opposed to the anhinga’s pointed one. We saw both species on the trail, along with many others too, as subsequent postings will illustrate. We visited the park on the first day of the government shutdown. Entering the park’s unmanned main gate felt a little eerie. The main visitor’s center was locked up tighter than a drum, but the nearby Royal Palm visitor center was open and more importantly so were its bathrooms. Royal Palm is managed by the Florida Federation of Woman’s Clubs and as volunteers, were exempt from the shutdown. This organization originally acquired the 4,000 acres around the visitor’s center and first got it made into a state park, before it was folded into the much larger national park. The quest for bathrooms became an increasing concern as we drove the road from Homestead, deeper and deeper into the park. There is not a lot of cover in the Everglades, but we managed. The lack of facilities did seem to tamp down the crowds. We spent the day hiking most of the short (less than a mile) trails that sprouted along the road. With millions of visitors every year, all of the trails were either paved or boardwalk. We hooked up with a group of out-of-state birders and followed them on down to Flamingo and the gulf. It is there that we saw yesterday’s osprey with fish. It was also there that I got my one mosquito bite of the trip. Don’t tell the park service, but I got the sucker. Overall, it was a very enjoyable and photographically quite rewarding day.